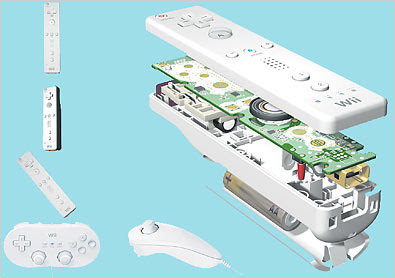 NintenGen: At the heart of the Wii.....MEMS? At the heart of the Wii.....MEMS? "Actions like pressing the buttons on screen or firing a weapon are conveyed between Bluetooth chips in the remote and in the console. The remote also contains a rumble pack, a component that vibrates to varying intensities based on information the console draws from the game’s programming and then passes to the controller. But the controller’s most-talked-about feature is the capacity to track its own relative motion. This enables players to do things like steer a car by twisting the remote in the air or moving a game character by tilting the remote down or up. He said the motion sensors, using the technology that activates vehicle air bags, can accurately sense three axes of acceleration: up and down, left to right, and forward and backward. This is mostly achieved within the MEMS, micron-size machines that depend on submicroscopic structures carved into the silicon. For example, one structure moves like a tiny diving board, stimulated by the actions of the game players. The structures are enveloped in an electrical field, Mr. Vigna said. When the MEMS elements are moved, the electrical field changes and the MEMS chip is sensitive enough to detect the changes. These accelerometers are so sensitive, Mr. Vigna said, because electrons — those subatomic particles that whirl around the nucleus of atoms like a video game in the making — can sense the subtle atomic-level movement of the silicon structures." Interesting read, Nintendo has not and probably will not expose the exact way the Wii remote was made but this gives a bigger picture for sure.